A bit of background. Every night my youngest asks me “What should I dream about?” For the last four years or so, I’ve come up with a dream for her. Most of the dreams centre around the world of Faraway, something that I created for my eldest 8 years ago, and which involves, Gnomes, all the types of Fairies, Grindleys, Gremlins and other sundry items. Tonight I say, “Dream about a Gnome bounty hunter, who’s hunting a Gnome that’s making Black Mushroom Beer and selling it to Grindleys.” As soon as I said it, I just knew that I had to make a note of that. I ran downstairs – not literally, that would be dangerous – and make a note in my dragon skin – yes, real dragon skin, I got it from the land of Faraway, to which only I have access – note book. 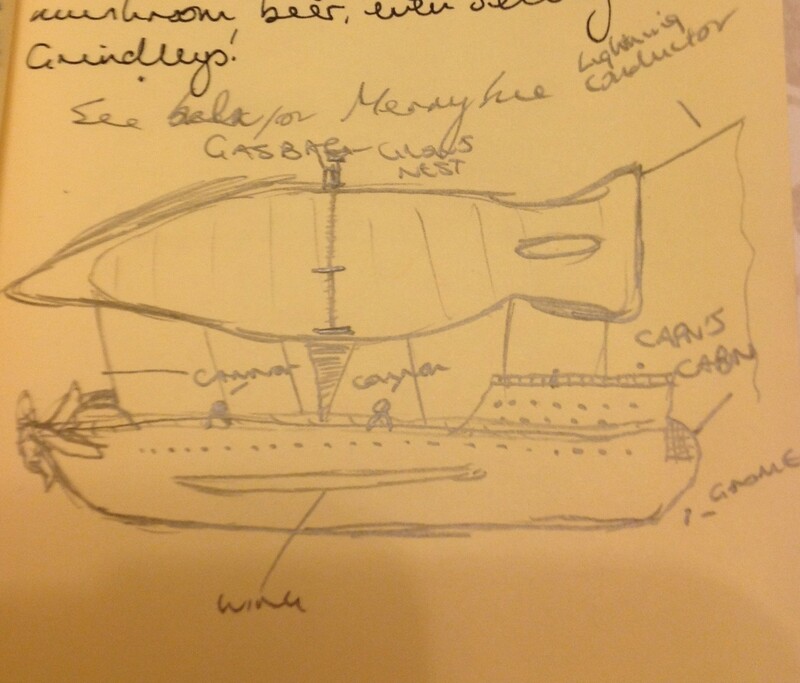 Then I drew a picture of the airship that he and his party members lived on, the Merry Sue. Then, I got my iPad, logged onto this blog and did some more typing and some character description. Enginair – Stokes, a Gnome enginair. Thank God I’ve already got a damn world designed for this stuff! To be honest, I can’t wait to surprise them with this story. The Merry Sue, battered and worn, but with one of the most powerful engines there is. I know, I need to add the damn engines, and a chimney stack. Reblogged this on Matthew Sylvester.